Week Late Period Negative Pregnancy Test? What Does It Mean? Home Pregnancy Tests PT Results & Interpretations Week Late Period Negative Pregnancy Test? Delaying of the period by a week is not unusual but still causes panic. A week late period negative pregnancy test can give any woman anxious moments. This is because most pregnancy tests say that they can detect pregnancy five days before missed period. You still patiently wait for the missed period and even after that you get a negative pregnancy test. Now you start worrying about endless things and call your doctor. You browse all possible resources on the net to get some assurance that nothing is wrong and you don’t have to wait for another month for getting pregnant. Look no further. We will explain you everything about this scenario! ???? 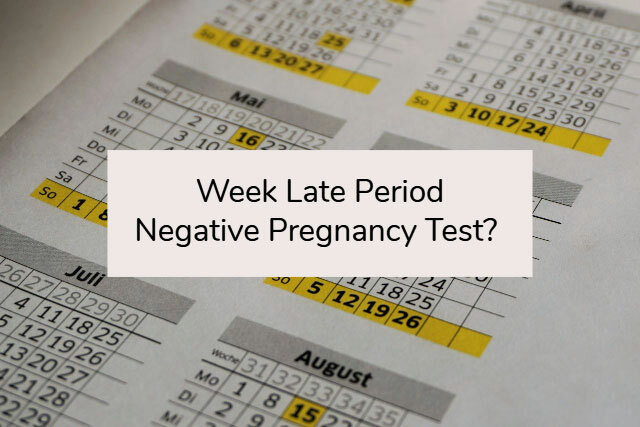 A one-week late period negative pregnancy test is not something to worry about. Most women get a positive pregnancy test at 3 weeks. But not all bodies are same and so can take more time to produce the hCG levels for the pregnancy test. Pregnancy tests have different sensitivities and so may not be able to detect lower hCG levels. On the other hand, a delayed period is not enough of an indicator that you are pregnant. Perhaps you know even simple flu can delay period or dieting for a month can cause a late period. If you don’t show any symptoms of pregnancy, then you must consider other reasons for the late period. If you have recently started a birth control, then your body needs time to adjust to the new cycle of hormones. Similarly, when you change your sleeping pattern you can get a week late period. Eating disorders can cause week late period and negative pregnancy test. If you have no symptoms of being pregnant, then you may be having a tubal pregnancy. A tubal pregnancy is unpredictable. Many things can go off beat during a tubal pregnancy. You may or may not get a positive pregnancy test in case of tubal pregnancy. It could also be that you are not taking the pregnancy test at the right time. During early pregnancy, your body has low levels of hCG. If you take a pregnancy test at any random time, then you may get a negative pregnancy test. It is the case when your pregnancy signs are also taking longer to appear. And even in other case, one week is too early to expect a lot of pregnancy symptoms. PMS and early pregnancy share the same symptoms like cramps and nausea. A week late period could also be a miscalculation. A woman who keeps a record of her menstrual cycle can detect a week late period, but for other women with an irregular menstrual cycle, it may go unnoticed. White discharge before period is a sign of early pregnancy and ovulation. The reasons for the delayed period maybe late ovulation. You could get week late period negative pregnancy and white discharge if your ovulation was late. One early pregnancy symptom is thick white discharge. It is for preparation of baby’s protection. If you see thick white vaginal discharge, then you must not rule out the possibility of being pregnant. It could be that your hCG levels are taking longer than usual to rise. The pregnancy hormone takes 48-72 hours to double, but it can take longer. You must tell your doctor about it and get a pregnancy blood test. If you have no symptoms and week late period negative pregnancy white discharge, then it could be an infection. Sexually transmitted diseases have a white discharge as a symptom. But in that case, the white discharge will have a yellow tinge and foul smell. Cheesy white discharge, gooey vaginal discharge, and smelly mucus are symptoms of infections. Other symptoms of venereal diseases include burning during urination, rashes, and bleeding. This situation arises when either you have a chemical pregnancy, or you are using a defective pregnancy test. An expired pregnancy test cannot detect pregnancy no matter how high the hCG level be. A pregnancy test has life because the dye can function for a limited time. 2 weeks late period negative pregnancy test is enough for you to get alert that something is not right. Period 2 weeks late spotting negative pregnancy test is a sign that you have implantation. Implantation bleeding is spotting and a symptom of pregnancy. Implantation is the process of attachment of the embryo to uterus lining. Only after implantation, the placenta starts forming the hCG hormone. The hCG hormone comes in urine after implantation. 3 weeks late period negative test is high time that you get a hospital pregnancy test. Three weeks is sufficient time for any pregnancy to have enough hCG for pregnancy detection. After three weeks you can get a positive pregnancy test at any time of day in some cases. But if you still use early morning urine, then you are most likely to get a positive pregnancy test if you are pregnant. Most pregnancy tests detect the hCG levels around 25 mIU/mL. It is mostly attained by three weeks of pregnancy. Period 3 weeks late but negative pregnancy test hints that you have some health problem. It could be any disease like ovarian cysts or fibroids. Previous articleWhich Is The Earliest Pregnancy Test? Next articlePositive Pregnancy Test Then Negative?